THE EGG™ Knife set – the ultimate gift for those who love to cook. 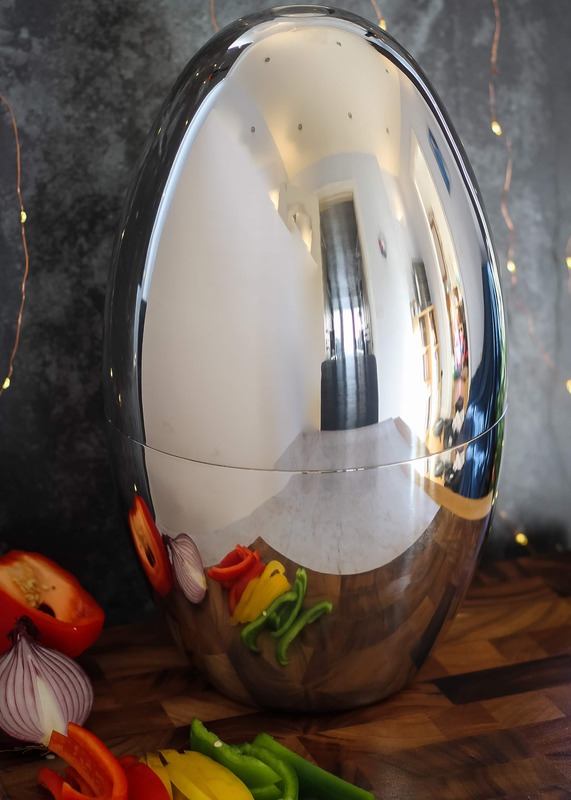 When House contacted us to ask if we could try their latest kitchen innovation -THE EGG™ – I was thrilled, as I knew it would make a stunning gift for a certain person who has a birthday in November. If you follow our food posts, and the Daddy_cooks_food Instagram channel, then you will know that great food is a huge part of our lives. You will also know that it is a particular passion for my husband, Matt, who takes his cooking skills far beyond a hobby, even while juggling a full-time teaching job. When you are serious about cooking, I am told, really good knives are an absolute must. 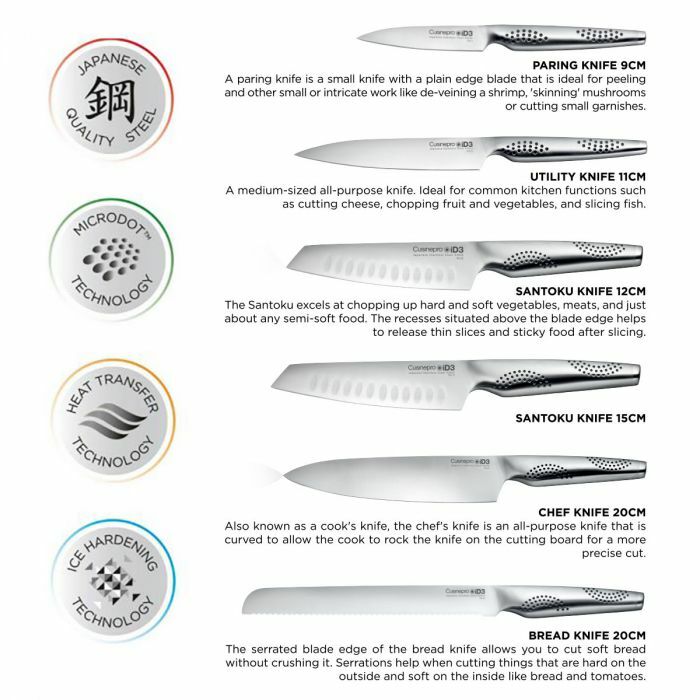 THE EGG™ includes some of the best knives available, hand-crafted from the finest quality Japanese steel. THE EGG™ itself also features a slick and contemporary design. 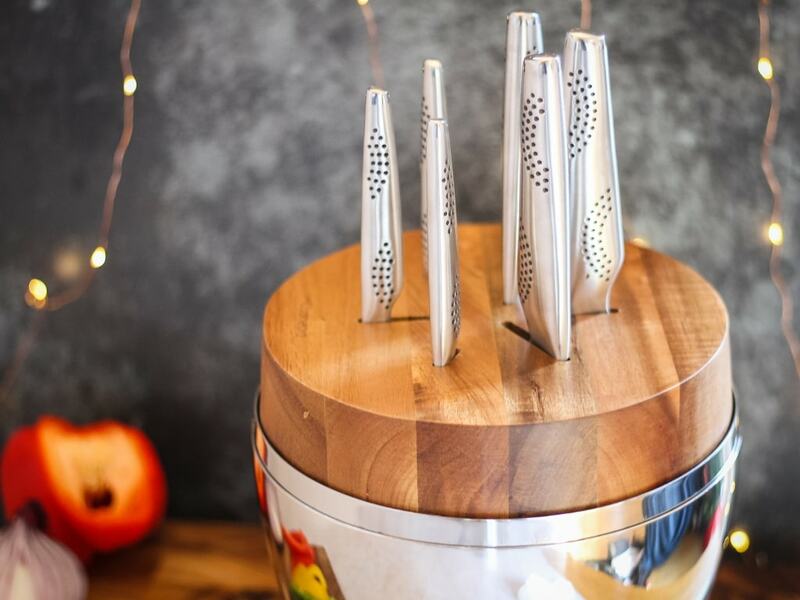 It is a beautiful statement piece that can turn cooking into an art – both the food and your kitchen! 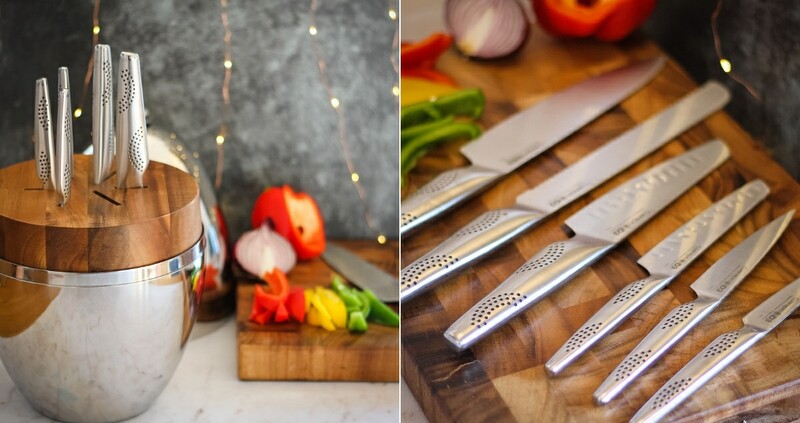 Not only do we have the opportunity to review THE EGG™, we are also pleased to announce that we have a stunning Cuisinepro Damashiro Emperor 3 Piece Santoku Knife Set, Value £199.99, to give away for one lucky reader. Check out the Rafflecopter below in order to enter. These are knives strong, precise and beautiful. They should last you a lifetime. Cuisinepro agree to just that – the knives come with a lifetime guarantee. THE EGG™ is a beautiful object. It is so perfectly shiny that it was hard to take photos without me in the reflection! It also comes packed in a luxe black velvet storage bag, and is a perfect gift for Christmas, weddings and engagements. I let Matt try out his early birthday present for the purposes of this review and he was very impressed and delighted to recieve such a beautiful and useful gift. Made from the finest quality Japanese steel and inspired by traditional Japanese craftsman and Samurai sword makers, Damashiro blades are made from specialist ice hardened Japanese steel. This makes them super tough, resistant to shattering and capable of being honed to a sharp resilient edge. The ergonomic pakka wood dark walnut handles comfortably mould to the user’s hand. The set contains a 17cm, 14cm, and 12.5cm knife. Please note, this is a paid post in partnership with House. All images and opinions are my own unless otherwise stated. For more information see our Disclosure Policy. I just recently bought a George Foreman Grill and love it! We have just lost somehow a knife we use for multi-purposes and need a replacement. I’m actually going to say my oven! When we moved I finally got my longed for Rangemaster and it’s everything I dreamt of! My Airfryer. It’s the best thing I’ve bought in a while. For me it would have to be my mixer. It saves so much time i just couldnt be without one now. not only good knives but decent pans too! My slow cooker, I set it away, go out for the day and come back to a lovely meal. My new no-oil frying pan. So healthy! My stand mixer. I love it! My husband is most important in my kitchen, otherwise I would have to do all the cooking myself! I love my bread maker! Best thing I bought! For me it has to be my dish washer as it gets used so often i’d honestly be lost without it. Kettle – gotta have cuppa tea! Our microwave broke recently. I didn’t realise how useful it was, until it was gone. Definitely the kettle, it’s the thing that gets used the most in the kitchen. My freezer! It can save bread before it goes off and I can pack so much stuff in it. We recently acquired a slow cooker and now we are wondering why we did not get one years ago it is so versatile. My Nan’s very old cheese slicer. I love it. The most important thing in my kitchen has to be the kettle, couldn’t live without my coffee!! My newest addition to my kitchen has to be my actifry! You can cook so many things in there! My steamer – I use it every day and it saves using several saucepans. I’d have to say it’s the knives for me. A decent knife goes a long way! And a slow cooker! Best thing we did when we had the kitchen replaced was putting in a 90cm Rangemaster cooker! It’s 14 years old and still works like new! My kettle I think! I can’t live without my cuppa teas! I love the slow cooker, you can cook all sorts in it, I could do with two! My kettle, could not live without it! My dishwasher is the most important addition to my kitchen because my husband and I are both disabled and we would be in trouble without it. My kettle. Can’t function without a cup of tea! Upgrading to a 4 slice toaster – breakfast has become a lot quicker! Good knives and saucepans make cooking so much more of a pleasure. Mine is my steamer, it’s great for cooking lots of veggies. Mine would be my 4 slice toaster. Since everyone wants feeding at the same it’s literally saved so much time and me not having to have every meal after the rest of the family. Extra counter-top space is the most important addition to my kitchen. My microwave a must to warm up my dinner when I’ve been working late. My husband, he likes cooking, I don’t! My espresso machine – I couldn’t manage without it, lol. I couldn’t live without my mixer. I regularly bake and I wouldn’t be able to do that if it wasn’t for my mixer as I would never be able to do it by hand. My oven. It doesn’t work at the moment but hoping to pick up a new one this black friday. I love baking cakes so I can do without most things but not a good oven. My lovely range oven. Even more special because I bought it with some money my gran left me in her will to remind me of her. She loved baking. I really miss my hand blender which has broken. So, that’s my choice for essential item, especially for home made soups. What is the most important addition to your kitchen? My slow cooker, I use it a lot. The first thing we did when we moved in was fit a rail and hooks to hang our pots and pans. It’s a small cottage kitchen here, so not much room. Cute though. It has to be my kettle, we couldn’t live without it! I have a really good quality copper based pan set which has been brilliant and used daily. My microwave oven, it does amazing crispy jacket spuds and a lovely pork joint with crackling. My 7″ chef’s knife, I couldn’t manage without it. A good reliable oven is the most important to me! The kettle – for the multiple cups of tea I make throughout the day! My steamer! I love steamed veg! My vegetable peeler…..be it small…it is mighty! I think quality knives would be a great addition but at the moment it’s my coffee machine! The kettle. I can’t do without many cups of tea! My dish washer – couldn’t live without it! My cirtrus juicer. I love starting each day with freshly squeezed orange juice. I have found that it is better to have an appliance that does one thing really well, rather than a so-so job of lots of things, like the machine I used to use, which was quite messy and not very efficient Plus my new juicer is easy to disassemble and put in the dishwasher, so I never worry about whether I should use it or not. My Coffee maker best thing l ever brought love our coffee and we got it on sale!. My slow cooker ! I just could not be without it ! Definately my dishwaaher. Such a godsend. My new fridge. Huge compared to the old one.